Do you like to journal? Have notebook for everything? Looking for a new fun way to keep pictures, drawings, art and thoughts? Then this workshop is for you. In the 3 hour workshop Becky will teach you how to create this fabulous junk journal. 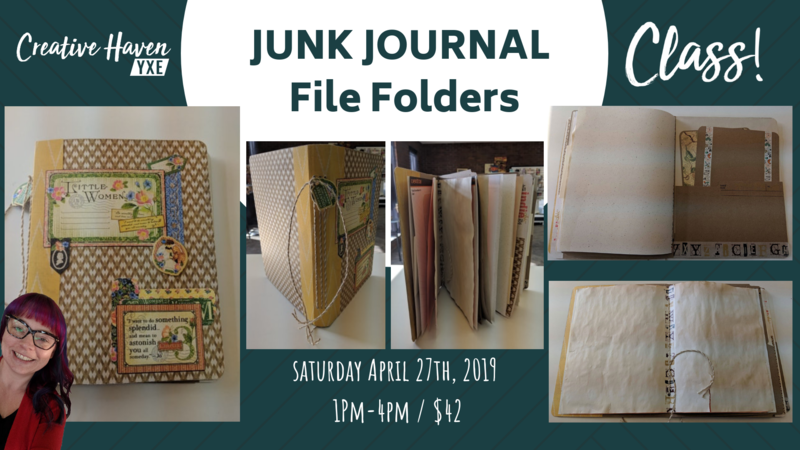 After huge demand for a second Junk Journal workshop Becky has created this super fun File Folder Junk Journal. In this workshop you will create this Junk Journal from scratch using file folders, coffee died paper, drafting paper and more. Becky has used Graphic 45’s Little Women paper collection to add to this Junk Journal. Graphic 45 paper is not included. Please feel free to bring you favorite paper to add to this journal. Please contact Creative Haven YXE with any questions about supplies. Class includes paper for the signatures and file folders. If you would like to decorate this Junk Journal please bring your favorite paper.